HGH is an abbreviation of the human growth hormone. It exists naturally in the human body. It is secreted by the pituitary gland, which is a pea-sized figure fixed at the lower side of the brain and responsible for managing the growth and development of the body and performance of the endocrine glands. It stimulates the growth of tissues, which helps in the growth of different body organs, makes bones strong, grows stature, and muscle mass. It also helps in stimulating the immune system and other anabolic hormones. Its synthetically recombinant form (HGH therapy) plays a significant role in curing patients, especially children, who suffer from growth hormone deficiencies (GHD) or some other medical issues. It is also utilized by bodybuilders or other athletes to augment muscle mass. Human growth hormone therapy controls the growth hormones in the body through injections. This genetically engineered or recombinant form is also known as somatropin, and it is used for treating patients who are undergoing growth related issues. Some of its uses which are approved medically are the therapy of those children who have a short height or who are diagnosed with a deficiency of growth hormones. In adults, it is used to increase muscle mass, decrease fat mass and other related disorders. Nowadays, HGH injections are not just considered as a treatment for those patients who have growth disorders, but it is also considered as a way of staying young. A lot of people who don’t suffer any of the growth hormone disorder also use these injections as an anti-aging medicine. In particular, bodybuilders who are in good shape still use these injections to enlarge their muscle lump. Lack of energy and enthusiasm. The feeling of tiredness and exhaustion. Harder to concentrate or pay attention. The quickening of pulse and heartbeat. Hair becomes less dense and attenuated. Sagging around eyelid and cheeks. An increase in belly fat. Other than that, children who suffer from growth hormone disorder usually are the ones who lack height. HGH therapy has some favorable effects on the person’s metabolism. It multiplies the protein compound, helps return carbohydrate metabolism to its normal state, cuts down bad cholesterol, and reduces fat. After HGH therapy, the body becomes stronger. With the correct HGH levels, the body starts losing unwanted and extra fat or body mass, and it boosts muscles. By improving the muscle mass, it also increases the strength of the muscle. HGH therapy helps in rebuilding lumpy muscles, and it starts showing results instantly. The human growth hormone deficiency also leads to the risk of heart diseases. It affects the heart size and its performance significantly. Thus, this therapy helps lessen any disorder caused by HGH deficiency and reduces the possibility of a heart disease. It also doubles cardiac output. It improves bone density and makes stronger bones. It also helps prevent damage to joints. The skin becomes denser after HGH therapy. It looks healthier and younger. It gradually reduces wrinkles from the face, and the skin perceptibly tightens. Also, there is a noticeable effect on the hair. It helps augment hair growth. Hair becomes thicker, denser and healthier. This therapy also helps in the improvement and regulation of the immune system. The vision of the person who is undergoing HGH therapy improves to a real extent. After HGH therapy, the person becomes more active, lively, and healthier. It is said to improve oxygen uptake, which keeps a person fresh and young for a long time. The person feels more enthusiastic and energetic. HGH therapy helps in improving mood swings. It also increases the psychological well-being. The person automatically starts feeling good about them and feels lively. Using HGH injections can be dangerous, however, if it is not used correctly. It should be utilized only on the advice of a qualified physician or doctor. Those people who use these injections as an anti-aging treatment, whether old or young, are at greater risk for side effects than normal human growth deficiency patients. One most talked about side effect is that it makes the pituitary gland lazier. 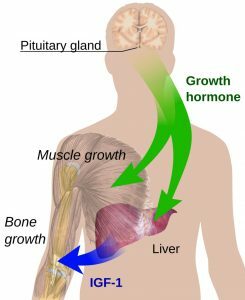 Due to the full dosage of human growth hormones through the injections, pituitary glands don’t feel like secreting real human growth hormones. Thus, if the application of injections is stopped suddenly, the body will lack growth hormones as the pituitary gland will produce hormones very slowly. It is hard to stop the injections abruptly because then the person will undergo the rebound effect and will lose the advantages he had gained during the therapy. It also increases the risk of developing acromegaly, which is a very harmful disease. It increases the risk of heart attack and death. It can cause an abnormal growth of bones in the hands, feet, jaws, and forehead. Some other side effects include fluid retention, pain in joints, gynecomastia, deterioration of liver, and carpal tunnel syndrome. According to some studies, those who inject themselves with massive doses of human growth hormone injections are likely to get cancer. However, the real human growth hormones secreted by the pituitary gland decreases the risk of cancer. It helps strengthen the immune system and supplies protection against cancer by producing cancer-fighting cells. As discussed above, HGH therapy provides a person with a quality life, but it also has some side effects. Always use the injections according to the doctor’s prescription and don’t increase or decrease the dosage by yourself. These statements have not been evaluated by the Food and Drug Administration. These products are not intended to diagnose, treat, cure or prevent any disease. No claim or opinion on our website is intended to be nor should it be construed to be medical advice or hormone diagnosis. Please consult with a healthcare professional before starting any therapeutic program.